In late 1938, the Red Air Force requested a new design for an anti-tank aircraft. Sergei V. Ilyushin’s answer, the IL-2 Shturmovik, would become one of the most effective aircraft of the Second World War and plays a major role in Panzer Grenadier: Fire in the Steppe. The first prototype flew in October 1939, but development took a long time as the designers sought the proper engine. A competing design, the Sukhoi Su-6, moved no faster, however, and Ilyushin’s team was able to fly a much improved aircraft a year later. The new plane, chirstened IL-2 in honor of its designer, was approved for production in early 1941. 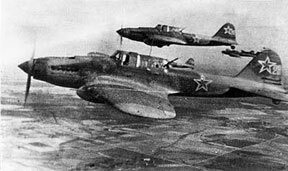 The first IL-2 production models carried two 7.62mm machine guns and two 20mm cannon. Launch rails carried eight 82mm RS-82 rockets. The single-seat aircraft featured an armored “bathtub” surrounding the cockpit with up to 12mm of armor plate, and the canopy was made of two-inch-thick K4 armored glass. Ilyushin argued strenuously for the two-seat model, but factory managers won out with their argument that they could make more one-seaters more quickly. When the Hitlerites invaded in June 1941, only 18 Shturmoviks (“Storm Bird,” a generic term for all Soviet “Armored Assault Aircraft”) had been delivered to operational squadrons, and they had little to no impact on the overall picture. In their first action on 1 July just outside Bobruisk, the attacking planes devastated their German targets and absorbed enormous punishment from ground fire. Before production could speed up, however, the factories making the new plane had to be relocated beyond the Ural Mountains. When they re-opened in late 1941, only one plane came off the line per day. Given that they had built the factory buildings around an open-air assembly line, managers felt proud to be making any planes at all, but in Moscow Josef Stalin had no patience for such excuses. Though Stalin clearly was channeling future wargame company management, his message brought results. Production quickly climbed, and Soviet pilots made good use of the machine in the spring 1942 campaign. But the Shturmovik proved very vulnerable to German fighters, and after a series of meetings with front-line pilots new versions began to appear that summer. 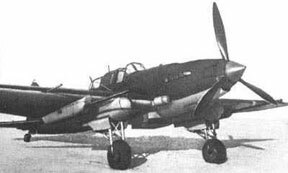 The improved IL-2M Shturmovik sported a more powerful engine and replaced the low-velocity 20mm cannon with much more capable 23mm weapons. The IL-2M3 that came out right on its heels added a rear gunner with a 12.7mm machine gun (a prototype feature that had been deleted to ease production). IL-2M3 Storm Birds seek their prey. Other innovations added to the Il-2M and IL-2M3 included the PTAB anti-tank bomb, a small hollow-charge warhead. A single Shturmovik could drop 192 of the 2-kilo charges. For defense against enemy fighters, the DAG-10 grenade launcher could place parachute-equipped aerial mines in the plane’s wake, a weapon straight out of the era’s bad pulp science fiction. More useful was thicker armor for the “bathtub”: The planes could rarely be brought down by anything less than 20mm cannon fire. The improved planes made a serious impact in the Saturn and Uranus offensives around Stalingrad in late 1942. Hundreds of white-painted Shturmoviki attacked German armored columns, coming in at 60 feet altitude or less in the “Circle of Death” maneuver designed to attack tanks from their more-vulnerable rear flank. A full squadron would circle continuously over the target, making sure that some part of the German formation always had to expose its vulnerable rear. 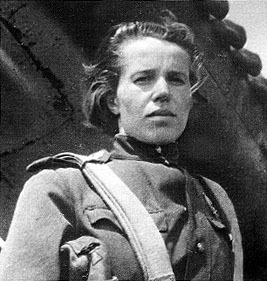 Sr. Lt. Anna Timofyenvna Yegorova. New models continued to upgrade the armament. The IL-2-37 which appeared in early 1943 replaced the 23mm cannon with a pair of long-barreled NS37 37mm guns. This variant greatly reduced the plane’s handling, and the cannons’ recoil often damaged the airframe. But in the hands of a skilled pilot, the 37mm cannons could punch through the thin deck armor of any German tank, including Panthers and Tigers. The Rs-82 rocket also gave way to the bigger 132mm RS-132, which provided a powerful hollow-charge warhead for use against armor as well as a high-explosive variant. The all-metal IL-10 appeared in late 1944, with a powered turret for a 20mm cannon replacing the rear gunner’s hand-operated 12.7mm machine gun. The new plane also carried four 23mm cannon for ground attack. Huge numbers of all models participated in the final drive to Berlin, and as German troop quality declined, Shturmovik pilots learned that they could rout Volkssturm formations simply by flying over them at low altitude even after expending all their munitions. Ugly but dangerous. The IL-2-37. The IL-2 appears in Panzer Grenadier: Fire in the Steppe. Because of the nature of the game’s very simple air support system (air support counters usually represent total air strength and not specific aircraft) the piece is available in all scenarios. As a variation, players may wish to return the IL-2 piece to the container and draw again for scenarios taking place in 1941, but this greatly hampers the Soviet player and we advise against it. Mike Bennighof is president of Avalanche Press and holds a doctorate in history from Emory University. A Fulbright Scholar and award-winning journalist, he has published over 100 books, games and articles on historical subjects. He lives in Birmingham, Alabama with his wife, three children, two turkeys and his dog, Leopold.